Yesterday, HideMyAss announced that 14 new servers were added on its network. These new servers are located in: London (10 servers), Manhattan in New York (2 servers) and Seattle in Washington (2 servers). For further information, go on HideMyAss’s official website. HideMyAss, the famous VPN provider, launches on December, 3rd its Xmas Holiday Promotions. Christmas Holiday Promo 2012 Details: 1 month: $11.52 > $9.99 (13% saving) 6 month: $49.99 > $39.99 (20% saving) 12 month: $78.66 > $59.99 (24% saving) Duration: 3rd December to 31st December. 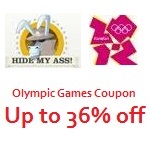 Those promotions are available on the HideMyAss’s website. The famous VPN provider, HideMyAss just announced it added 14 servers last week: 1 in Greece 1 in Brazil 2 in Germany 2 in The Netherlands 8 in USA HideMyAss now reach +26,000 IPs, 231 servers in 42 countries.